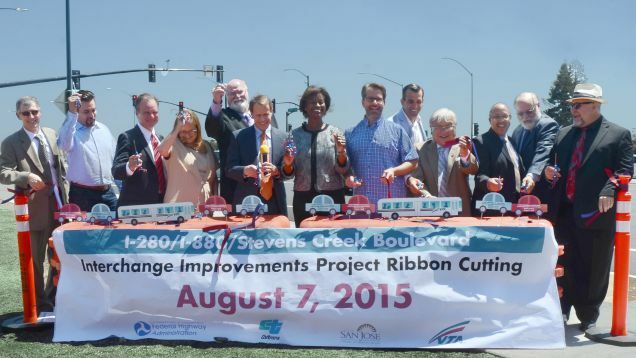 On Friday, August 7, transportation and elected officials celebrated the completion of the $62.3 million I-280/I-880/Stevens Creek Boulevard Interchange Improvements Project. VTA, the California Department of Transportation (Caltrans) and the City of San Jose partnered to deliver the congestion relief, access and safety improvements in one of the most heavily traveled corridors in Santa Clara County. 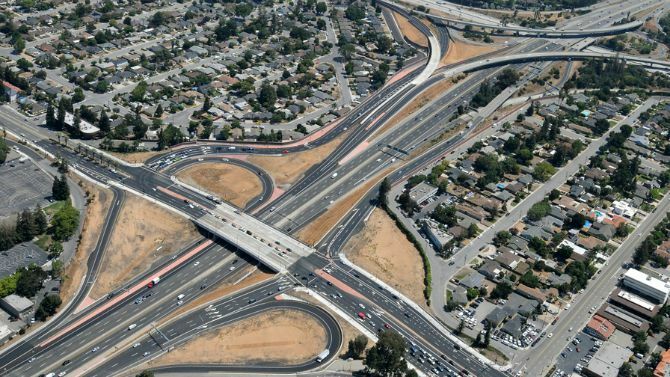 The project reconfigured the existing I-880/Stevens Creek Boulevard cloverleaf interchange (originally constructed in 1959) which included widening and realigning ramps, improving intersections, and widening Stevens Creek Boulevard over I-880. “VTA’s role as a congestion management agency means that we are continuously working with many stakeholders to improve, innovate and deliver transportation options that keep this valley moving forward,” said VTA General Manager/CEO Nuria Fernandez. The project added a new direct connector ramp between northbound I-280 and northbound I-880 to separate the freeway-to-freeway traffic from the local street traffic that is destined for Stevens Creek Boulevard and San Carlos Street. “This interchange, that became obsolete, has been transformed to handle the heavy traffic demands of the future and is a prime example of how California can fix its aging transportation system through wise and strategic investment," said Senator Jim Beall. In 2007, the project received funding from various sources for the environmental and design work and to acquire right of way for the project including: a $19 million Federal earmark; a $1 million Federal grant from Metropolitan Transportation Commission (MTC); and approximately $3 million in local funds from VTA and the City of San Jose. In 2011, VTA applied to the California Transportation Commission (CTC) for construction funding and in May 2012, VTA received the $39.3 million state allocation. The VTA Board of Directors awarded the construction contract to DeSilva Gates Construction in September 2012. Congressman Mike Honda (D-17) successfully advocated for the $19 million in federal funding for the project. "This project is a perfect example of what can be done when all levels of government come together and pool their resources to improve commute conditions so that Silicon Valley may continue to thrive,” said Honda. “This project took an outdated interchange and gave it new life, not just for freeway commuters but for those traveling on local streets by car, bus, bike or on foot,” said MTC Chair and Santa Clara County Board President Dave Cortese. A new direct connector from southbound I-880 to Monroe Street was also constructed, providing improved access to Westfield Shopping Center and surrounding neighborhoods. “As San Jose experiences inevitable population and job growth, this new interchange enables economic growth and corresponding tax revenues to provide services to residents,” said San Jose City Council member Pierluigi Oliverio. "These improvements have brought relief to thousands of commuters, residents and shoppers which brings me relief and highlights what public service is really all about,” added San Jose Mayor Sam Liccardo. Event speakers include Congressman Mike Honda, State Senator Jim Beall, Caltrans Director Malcolm Dougherty, Santa Clara County Board President and MTC Chair Dave Cortese, Santa Clara County Supervisor and VTA Board member Ken Yeager, San Jose Mayor Sam Liccardo, San Jose Council member Pierluigi Oliverio, and VTA General Manager/CEO Nuria Fernandez.